Sometimes trees can benefit from structural support. In cases where a tree is well suited to an area, or is planted by an ancestor, or just well-loved, cabling can hold a tree together and prevent the loss of a limb or splitting of a double trunk. If you think a tree may need cabling, call Boutte Tree for a consultation with an arborist. If you decide to install one or more cables, make sure that they are professionally installed. Sometimes the best strategy is to lightly thin the tree’s crown in conjunction with cabling. There are presently two kinds of available cables: Static steel cables and Dynamic synthetic cables. Both types of cables are used to support weak unions in the tree, almost always in the case of co-dominant stems (“double” trees) or a cracked branch union. The cable should be installed about 2/3 of the distance from the weak union to the end of the stem. The design and installation of both are described below. These high-strength steel wires, usually between 1/8″ to 3/8″ in diameter, are attached with hardware into the trunk of the tree. For small stems a J-lag screw should be installed to the full length of the threads. Any large branches or trunks should have drop-forged eye bolts extending through them and held with a washer and nut on the back side. Cables should be swaged or dead-ended to a thimble that goes around the J-lag or eye bolt. The thimble prevents severe bending of the wire. Cables are installed with enough tension to remove all slack from the cable. There are sometimes complications arising from steel cabling. Because trees naturally add wood to their circumference every year, they annually strengthen themselves to compensate for co-dominant stems, large limbs or other imbalances. They strengthen themselves by adding wood where it is most needed, reducing the stress in that area. Known as the axiom of uniform stress, this follows from the observation that trees always have much thicker growth rings in areas of high stress. Adding a cable can help support the tree, but may result in less wood formation to support that part of the tree that has been cabled. Thus, steel cables once installed must be maintained and replaced when necessary. In general, steel cables are recommended where the union is prone to a sudden failure, such as in very brittle trees, or in the case of partially cracked unions, or unions that have a well-defined plane of crack propagation. Synthetic cables are made of high strength rope with some shock-absorbing properties and attached around the trunks instead of through them. They vary in diameter from 3/8″ to ¾” in diameter. The cables are attached loosely and only become tight when the tree is deformed due to load. At the point where the cables go around the trunk, a wide insert spreads the load to prevent the rope from damaging the bark. The cables are self-adjusting and become larger as the tree gets bigger to prevent girdling. Synthetic cables are gaining in popularity due to their ability to allow the tree to grow naturally, yet still aid in an emergency. In general synthetic cables are recommended where the failure between the stems is likely to be more gradual, such as unions with an obvious cracking plane on only one side of the union, or in trees known for their toughness (in the engineering sense, that is! ), or trees with U-shaped unions. A U-shaped union is less prone to failure because there is no one place for stress to concentrate. Solitary trees in an open landscape, or trees that rise above surrounding structures, are especially at risk for lightning strike. Lighting rods installed in trees can save the life of not only the tree, but people nearby as well. Lighting rods must be well grounded and the tip should be installed near the very top of the tree, although not necessarily beyond the last leaf. For large trees with broad canopies, several rods should be spread throughout the crown. The grounding wire should be stapled to the trees bark and securely bolted to the grounding rod, which should be made of a non-corrosive material and driven at least three feet into the ground. If possible all cables in a tree should be grounded as well. Here in Atlanta there are 10-20 lightening strikes per square mile every year, which is higher than most of the country. You can recognize old lightening strikes by the long vertical strip of bark that is missing from the tree. 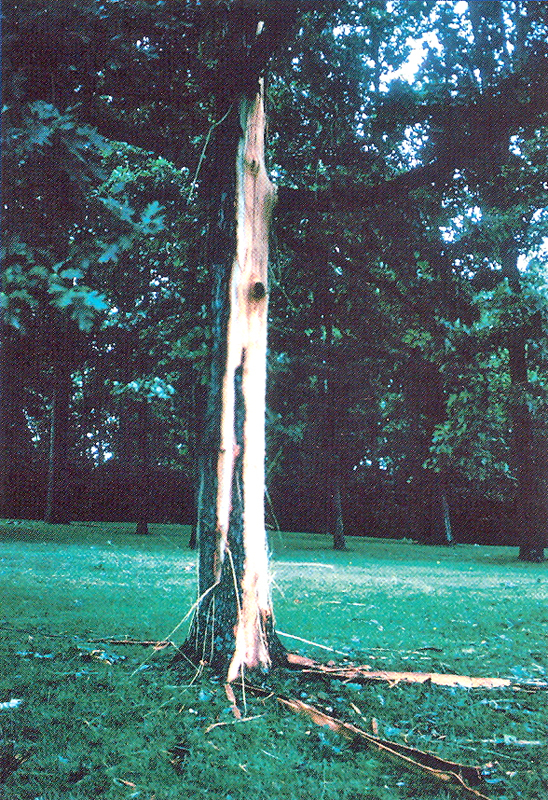 When the tree is hit, the huge amount of current heats the water is the tree enormously, vaporizing it and blowing the bark off like a pressure cooker with the top poorly secured. 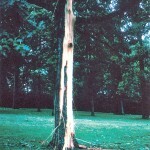 Contact Boutte Tree Inc to consult with an Arborist about protecting your beloved tree from lightning!